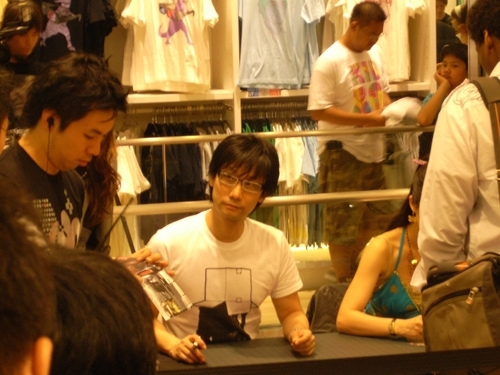 On a hot summer Thursday in June, throngs of eager MGS4 fans spent hours in front of UNIQLO’s flagship SoHo store in wait for a glimpse of the creator of the famed Metal Gear Solid franchise, Hideo Kojima. 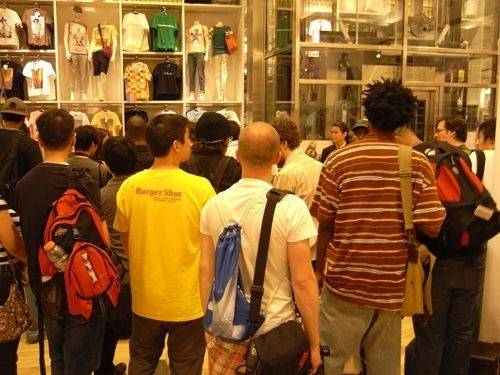 As part of the MGS4 world tour, Kojima Productions and Konami made a stop at the UNIQLO store to promote limited edition MGS4 t-shirts, and to promote the highly anticipated game. Catering to the fans, Kojima and voice actress Yumi Kikuchi dedicated 2 hours to signing over 300 pieces of fan memorabilia; including everything from the original Metal Gear cartridge for the NES to a bag of wasabi-flavored Doritos! 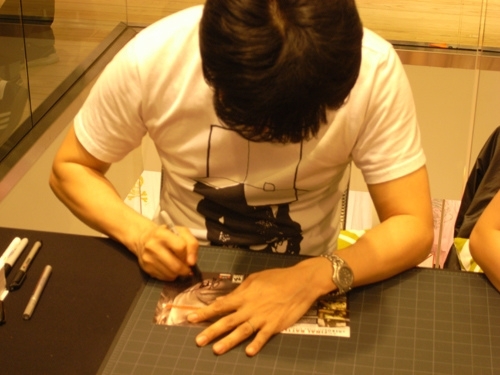 Kojima, being very humble and gracious, penned his signature and shook each patrons hand. Yumi Kikuchi was as equally kind, smiling and thanking each fan to pass through. For those lucky enough to make it, it was a very rewarding experience. Legendary video game creator Hideo Kojima will be on hand Thursday June 12th, at the UNIQLO Soho Store in lower Manhattan for a special autograph signing session! This session is to celebrate Konami’s North American Launch of the highly anticipated tactical espionage action series Metal Gear Solid®4: Guns of the Patriots and to commemorate UNIQLO’s LIMITED edition series of MGS4 collaboration t-shirts. Exclusive details after the jump. Autograph signing with Metal Gear Solid series creator Hideo Kojima and Yumi Kikuchi, actress for Raging Raven (featured in MGS4) – They will be signing MGS4 box art sleeves for the first 300 attendees! 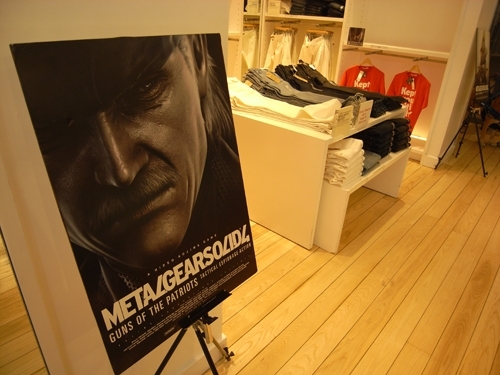 Celebrating the long-awaited worldwide release of Metal Gear Solid®4: Guns of the Patriots and release of limited edition Metal Gear Solid®4 x UNIQLO collaboration t-shirts, for sale in-store. Contact to taeko (at) newyork-tokyo (dot) com, if you are press and would like to attend. 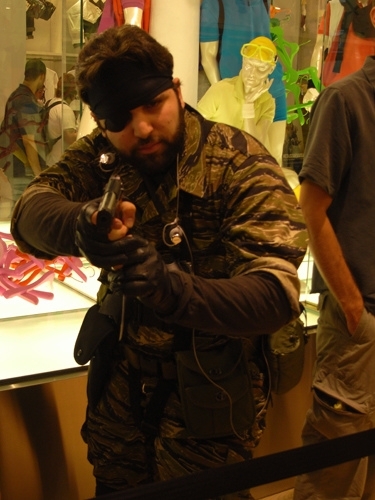 © 1987 2008 Konami Digital Entertainment Co., Ltd. “METAL GEAR SOLID” is a registered trademark of Konami Digital Entertainment Co., Ltd. “GUNS OF THE PATRIOTS” is a trademark of Konami Digital Entertainment Co., Ltd. KONAMI is a registered trademark of KONAMI CORPORATION. “PLAYSTATION” and “PS” Family logo are registered trademarks of Sony Computer Entertainment Inc.
New York-Tokyo is giving you a chance to win one of six EXTREMELY limited edition Metal Gear Solid 4 posters, signed by series creator Hideo Kojima himself! Kojima will be in NYC next week to celebrate the worldwide release of his magnum opus, Metal Gear Solid 4: Guns of the Patriots. 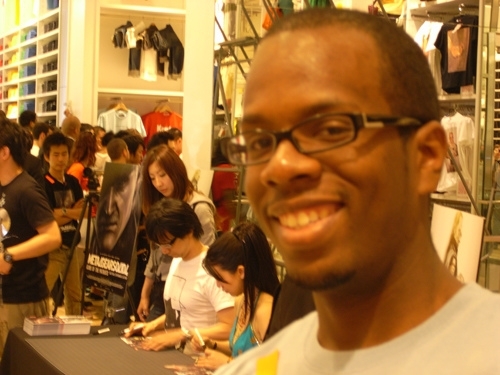 He will also be on hand for an autograph session at UNIQLO Soho! More info on that HERE, and for all contest details hit the jump below. 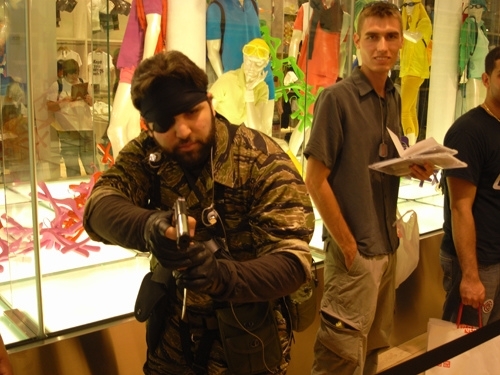 * To enter, simply send us an email with your name and contact information to mgs4 (at) newyork-tokyo.com by Friday, June 13, 2008. * Prize winners will be selected in a random drawing. Winners will receive an email from New York-Tokyo informing them that they have won, and must respond by email with their full contact information (name, age, phone number, mailing address) within five (5) business days to claim their prize. In commemoration of Konami’s highly anticipated title Metal Gear Solid 4: Guns of the Patriots, UNIQLO has collaborated with several world renowned designers to develop a series of t-shirts that feature cryptic messages for those who play the game. LOGAN, a motion graphic production company known for its commercials and music videos, Power Graphixx, and the Kusano Design Office contributed their unique designs, and the three pictured above will be available exclusively at the UNIQLO Flagship Store in Soho. The other three, sadly, are only available in Japan. What else is new?!? 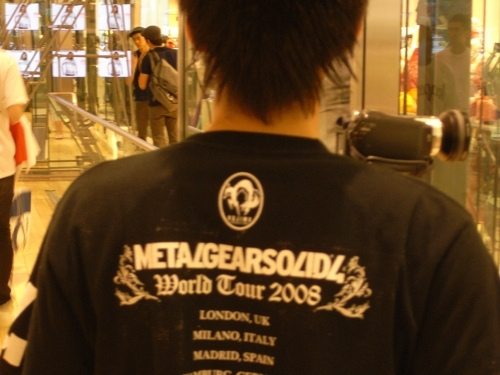 Well, at least us rabid MGS4 fans can snag these shirts while we scramble to get autographs from Mr. Hideo Kojima himself when he comes to town next Thurdsay, June 12th. For details on that, click HERE.